Having tested the prototype in late November, I would like give you a short synopsis of my feelings about Fujifilm X-H1 from a wildlife photographer's perspective. I have to say I am very happy with the results from my Fujifilm X-T2. But Fujifilm keeps producing innovative cameras. The Fujifilm X-H1 is for serious videographers and action/wildlife photographers, I have listed in no particular order the features that wildlife/sports photographers have been asking for and that FujiFilm has delivered. But first of all, check out my pics of the prototype camera in comparison with my Fujifilm X-T2. "The Fujifilm X-H1 is a mini GFX 50s"
I am not a fan of photographing a subject without some form of stabilization eg bean bag. But I now know that if I have too, I can do so with the complete confidence of getting sharp photos with the new IBIS. The images above and below of zebras fighting were grabbed shots over my shoulder, hand holding the FujiFilm X-H1 with the XF100-400mm. I could not believe my eyes when the action had finished that I had so many keepers, IBIS works and works well, the AF is faster and better than X-T2, I will not be surprised if a firmware update for XT-2 with the improved AF will come soon. The AF-custom modes are more accurate, the Zebra photographs, I used "AF-C" Preset Mode 5, Erratically moving & accel./decel. subjects. It is all in the detail, the RAW images from this new processor are impressive, unless you use a RAW converter like "Iridient" you will not really get the best out of your files, LR and Capture one, lag behind Iridient in processing FujiFilm RAWS. I will be writing a blog post soon about the Iridient raw converter. I have been waiting for this feature. In my old DSLR days, I used Back focus all the time, It will be really great to be able to use this feature again. Wildlife photographers are a pretty tough bunch and need a camera to match. The FujiFilm XH-1 has a tougher body and is powder coated so it will be difficult to scratch, no more rubber peeling. The slight increase in bulk is so important to those of us using the longer lenses, XF200mm or the XF100-400mm. The extra bulk feels really good in the hand and the camera lens combination feels more balanced. The grip is amazing, almost dare I say reminiscent of my old NiKon DSLR handgrips. The measurements of the XH-1, 139.8 x 97.3 x 85.5 compared to X-T2, 133 x 92 x 49 mm. The weight of the X-H1, 623g, 675G with grip and batteries, FujiFilm X-T2 Weight 507g, 565g with grip and batteries. "I cannot emphasise enough the significant difference the size and form factor for user comfortability, especially balance with the longer /heavier lenses"
Wow, the shutter button is soft and sensitive to touch, a real delight to use. I love the new shutter button. The retro exposure dial has gone, and now an LCD display or sub monitor is in its place, many people will miss the retro dial. The new exposure compensation button is next shutter button and sub monitor. I assume the reasoning behind the demise of the "expo comp dial" and the introduction of the new LCD display, is for those making videos, from the menu videographers can set up a video settings display in the sub-monitor so they do not have to clog up the back LCD with those settings. "I would not be surprised to see sub monitor in the rumoured FujiFilm XT-3"
Overall even though I only had use of the FujiFilm X-H1 for a few days. I loved this new flagship camera. "I can not wait to get my hands on my own FujiFilm X-H1 soon"
As a sports photographer, specifically focused on action sports photography, I look for a number of key features; lightness and portability to allow me to be as mobile as possible, auto-focus tracking capabilities, good burst speed to allow continuous shooting and high dynamic range to allow me to create an image that is the best possible version of itself. The X-H1 gives me all of these things and more. After spending two days of shooting motocross with the camera I found that it had the lightness and portability of its sister camera the X-T2 but with better ergonomics. As a big guy, I appreciated the larger grip and the forward and tilted release button. The focus tracking when paired with the 10-24mm, 55-140mm and 100-400mm lenses was exemplary and really did work incredibly well, it is a testament to the camera that I had very few out of focus shots from these two days of shooting. Finally, and unexpectedly. I think FujiFilm have found a sweet spot with the CM continuous firing mode, it allows a good frame rate to be captured without you ever hitting the buffer of the camera, I shot mostly in this mode and thought it was wonderful. In this FujiFilm made video I talk about my photography philosophies and why I shoot FujiFilm cameras. The video was made as part of the launch campaign for the new FujiFilm X-H1 camera. The XH-1 does not add a huge amount more to my genre go photography to what the X-T 2 offers. There are however a couple of features that will come in very hand. Firstly I really loved the resolution of the viewfinder, it is crisper and has a bit more resolution than I found on any other X-Series bodyThe status panel at the top is really handy to me, it has replaced the exposure compensation dial, which I never use. Doing a lot of night time photography I would have to say that this is an extremely handy addition form.I love the chunkier grip which makes the camera feel very secure and at home in the hand when walking around and photographing street scenes. The IBIS is another feature which I could very easily fall in love with, although my camera is mostly on a tripod, I also often find myself shooting handheld at a shutter speed of 1/10 to around 1/30, especially when I have the 16-55 f 2.8 strapped to the camera.The JPEG quality was also amazingly sharp straight out if camera. I think the new IBIS will help photographers to get beter more stabilized images in low light situations at the reception. This will also be helpful if you don't have a lens with image stabilization. The new Auto Focus will really help you focus much more accurately and help to focus lenses are a bit slower to focus much better. The flicker reduction mode will help you when you to shoot in different lighting situations especially where there are LED lights creating lines across your images. The new video features on the camera like filming on F-log on the SD card, IBIS, new cinematic film simulation and 120 frames on 1080 HD are really incredible. As a documentary and lifestyle-photographer. it is important for me to have a camera that’s responsive and still compact enough to not be intrusive. 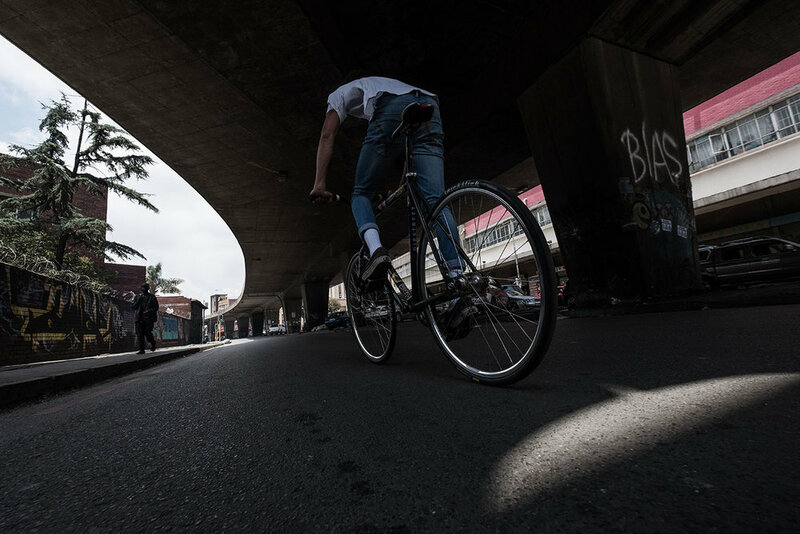 I had the privilege of testing Fujifilms XH-1 whilst inline skating around Johannesburg CBD and capturing images of a fixed gear rider cruising the streets on Johannesburg. bigger/deeper grip which felt really great in my hand whilst skating and capturing moments of the fixed gear rider. It’s amazing to have a camera in your hand that gives you the ability to actualize your vision and that’s exactly what FujiFilm XH-1 helped me achieve. HD slow-mo recording as well the exciting announcement of in-body image stabilization. (IBIS), the X-H1 looks to be an incredible addition to the Fujifilm line-up of cameras. of the still's we have come to love from Fujifilm X-Series Cameras.